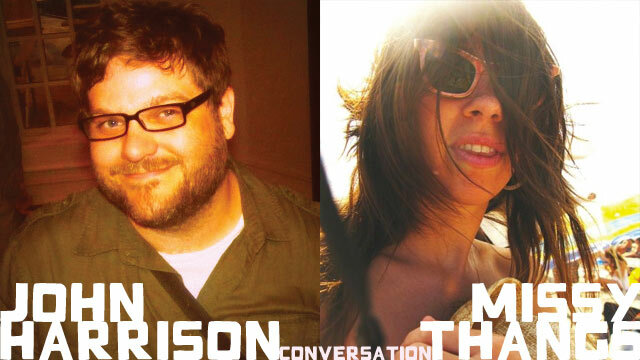 Missy Thangs of The Love Language and Soft Company joins John Harrison of North Elementary at the Orange County Social Club in Carrboro, NC to talk about writing and recording music, the new North Elementary record, and visual art. MT: You just released a record called Southern Rescue Trails, and this is your sixth record with North Elementary right? MT: I heard your interview on WKNC last week and it sounded awesome. I heard a lot of the songs, and also peeped them out online. Super cool record. Love it. So my first question: What are Southern Rescue Trails? JH: Well first I just like the combination of different words together for lyrics and everything, but that one has special meaning because the subject matter of the record is me getting back in touch with southern music or where I grew up which is North Carolina. As a kid, I loved the Pixies and all this music was coming from so many other places. My mom likes Appalachian music and stuff like that and that was a turn off, you know? As I get older, I’ve been like, I need to be familiar of the music from my area. This record doesn’t sound like that, it’s just me growing up in the South, a lot of it lyrically and musically. I’m getting married next year, which is super exciting. My girlfriend’s on the cover of the record actually, the dance party. MT: She looks awesome. Like she’s partying! JH: I think that was after a 506 show. The “Rescue” is about falling in love with somebody. A lot of the lyrics are about my time meeting her, in a weird cryptic way. I don’t really spell things out very much in my lyrics I don’t think. “Trails” is just the journey. It’s just sort of like falling in love in the South and my journey. MT: Moving to your songwriting process: What is the first thing that you do when you start a song? JH: I don’t even really know where a song starts, but, honestly, at this point it’s in my head most of the time. It’s something I hear while I’m walking around or maybe even I hear something in another song like a little piece and I’m like, oh that’s pretty cool, I’d like to expound on that. But I play guitar a lot and have my studio set up to demo all the time just so when that I happens I can go in there and do something. MT: So a lot of times, you’ll start with a guitar as opposed to a beat or a vocal melody? JH: Pretty much everything starts with an acoustic guitar. It’s what I play the most. JH: I have to be sold on the lyrics. That’s huge for me. Some songs will be waiting for that process. Like, the song’s done, it’s ready, but I have to get behind lyrics I might possibly be singing for a couple years. I think about that, like, “That lyric sounds really great. Can I get behind this, do this every night and feel semi-real about it?” You’re not going to be in the moment all the time, but I have to sell myself on it. MT: That sounds like an experienced songwriter and performer talking. JH: You’re already up there doing your thing and it’s cool and people are really into it, but some nights you’re playing for ten or twelve people and I’ve got to find ways to enjoy playing it myself as well. So my barometer is if I dig it. I can’t expect other people to dig it if I don’t. MT: What ran through your mind when you realized Southern Rescue Trails was ready to go to production, or ready for mastering? JH: Oh you know, out of money, out of time. I mean, I’m pretty methodical with that stuff. I have a way I do things that I’ve learned works well for me and actually I’m on a budget. I usually do it in three parts, like a tracking phase part, then I purposefully take of two or three weeks off, work on overdubs myself, then return to the studio and do the overdubs that are on the actual recording. Then I take a few weeks off and we go mix. I need that time away. But then it’s like as soon as possible, as soon as I’m done I want it out. MT: So a little impatience and excitement? JH: Well there’s something really fun about putting out a record. Every time it comes back in the boxes and you’re unwrapping the shrink-wrap. You know that feeling never gets old. But you know, I’ve usually written a lot of songs by time that happens. JH: That’s a tough one. There’s probably two that fall into that category. One that is the more acoustic song on the record, “Southern Elevators,” because I didn’t know what I wanted to do because it’s not sonically as expansive as some of the other stuff. Eventually I just decided I wanted to have my friends play on it, like Sarah Bell, and Margaret White who I used to play with in The Comas. There’s so many ways you can do every song. That one I really had trouble selling myself on how I wanted to present it. Then “Hillcrest 101” just because that was one of the earlier songs written. I had that song around for about two years before we recorded it. So the longer I have to think about something the more I realize there’s a million ways to do it. So the easiest song, and my favorite songs, are generally my last songs that I’ve made because I don’t have time to do anything with it. I tend to tinker. MT: This one is probably something you could pass along to other aspiring songwriters, engineers, producers… What was the biggest lesson you learned in the making of Southern Rescue Trails, anywhere from songwriting process to mixing..
JH: I prefer going to studios to have designated space and time to do stuff. I don’t go to the studio (this is going to sound horrible), I don’t go there to be ultra creative, I’ve done all that stuff. It’s too expensive for me to be there with a song out of thin air. I think being prepared and being patient. You know, it’s a long process, it’s exciting when you first hear the basic tracks, but I feel you really need to be patient with stuff and let it come to you. Sometimes your ideas aren’t going to be the ones that sound the best, and you have to be open to that. I don’t know how that happens, but the longer I do it, the more open I am to it. MT: What was another artist’s record you listened to the most while recording Southern Rescue Trails, or did you listen to anything else during that time? JH: I’m always listening to other peoples’ stuff, but, and this sounds kinda crazy to say, but I’m always listening to my stuff too and not my past songs I’ve written, but just whatever demos or songs we’re currently working on. When I’m recording a song, I want to hear the demos before we went into the studio, the basic tracks after that, so I spend a lot of time listening to my own stuff. I know that sounds weird, but it’s absolutely true. I think I was listening to a lot of My Morning Jacket at the time. There’s a song off their Z record that I based a lot of “Sharp Ghost Mind” off of. I do that a lot. I get a record and I think, oh I want to figure out how to write that kind of song. JH: I’ll take a song I want to figure out, inevitably by the time I do, it’s not like I’m aping it completely because I don’t play cover songs really, I don’t know how to do that. But it’s an inspiration for my version of a song. Dinosaur Jr’s Farm came out around that time, and it’s sonically awesome. I was also listening to the last LUD record a lot, Kirk Ross and Lee Waters. MT: Now I’m going to name a song, and you must respond with the first word that comes to mind. MT: I love the videos of the songs you posted on your website. They’re the songs from Southern Rescue Trails and I notice they’re all done by colleagues, artists, musicians like Maria Albani, Nathan White, Billy Sugarfix, Zeno Gill and more. What inspired your idea for doing this? I wanted the record to come out in the Spring but it couldn’t come out until this Fall, so I wasn’t sure what to do. It was sort of a way to just do something. So I asked a lot of my friends and people I know who did that stuff and everybody was so awesome about it. I can’t believe more bands don’t do that. Maybe it’s a lot to ask; I don’t know the scope of what’s a lot to ask of somebody sometimes, or what’s weird or crazy to do. Lou Barlow did it so that gave me the idea. So it has been done, but I was just amazed that everybody was into it. They picked the songs they wanted to do. I didn’t realize until they started coming in that it was a lot to ask these people to do. I think it was received pretty well and we had fun doing it. MT: Music is often as much of a visual experience as an aural one. I understand that you’re a visual artist. Who are your favorite artists that also lead lives as musicians? JH: Honestly, Laird Dixon. Shark Quest took me out on my first tour in 1999 for more than two weeks, and I love Laird who does a lot of stuff with molds. Ron Liberti is another who is my go-to guru for screen-printing from Pipe, Ghost of Rock, Victory Factory and all the bands he’s been in. Honestly, I derive a lot of inspiration locally. Otherwise, David Byrne does some pretty cool stuff, and David Bowie, but mainly Laird and Ron. MT: With regards to your record, Southern Rescue Trails, I hear a lot of texture and collage in your music. Since you’re a print artist, doesn’t that have a lot to do with layers and textures? How similar is printmaking to recording a song for you? JH: I think they’re very different. Printmaking you can do a lot quicker. It’s an individual sport rather than a team effort, at least for me. Even though I’m a songwriter, it’s important for me to have a band. I like communicating with other musicians. I need that. In terms of layering, I think they’re a lot of similarities. I tend to latch onto something that is fundamentally good, a good song. All the collaging doesn’t matter if the song isn’t any good, it’s just a lot of cool noises, but it’s only interesting if the song is good. It is the same with printmaking. I spend a lot of time trying to make something that’s definitive, but then you spend the rest of the time trying to make it interesting, or deconstructing it. MT: You are one of the co-founders of The Sound Minus Research Project curating local musicians’ work. You’ve receive national press for this project from sources like Pitchfork, so you’re getting attention outside of the Triangle, which is really cool. You’ve featured works from artists in Superchunk, Bower Birds, Pipe, yourself and a lot of other folks from around here. You’ve been doing this with Maria Albani since 2006 — five long years! My question to you is: What are the criteria for being a part of the collective beyond just being a musician? This is for people interested in participating in your project. JH: Nothing really. It’s funny, we joke about the rules and how they’re subject to change at any time. Basically you have to have some affiliation with North Carolina music. You don’t have to currently be one. It’s very loose. We would like to include people who do R&B and bluegrass. We’re definitely curious to see what’s out there that we’re not familiar with in terms of musicians. Who knows what the future holds.